Pompano Beach Dentist | Endodontics Will Treat Your Damaged Pulp! Are your teeth sensitive to certain foods that are too hot or too cold? Do you experience sudden bursts of pain in your teeth? If so, you may have an infection that should be treated as soon as possible. In order to maintain the strength of your teeth it may be time to visit Dr. Joseph Camuccio, who specializes in endodontics. 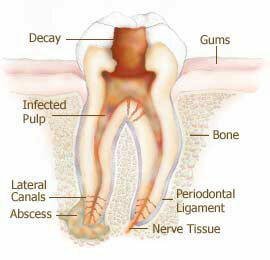 Endodontics utilizes therapeutic measures to treat the soft inner tissue of the teeth, called the pulp. Sensitive teeth and toothaches are some of the most noticeable symptoms for injury to the pulp. This type of injury is most likely caused by tooth decay, severely cracked teeth, or the buildup of bacteria in tiny crevasses of the teeth. Dr. Joseph Camuccio will immediately assess your condition and formulate the most effective endodontic therapy that will ensure the health of your teeth. Without the proper endodontic treatments, patients run the risk of permanently losing their teeth. Not only will the loss of your teeth making you feel self-conscious, but the amount of money used to replace your missing teeth will be heavy burden on your income. For this reason, it is vital that individuals contact Dr. Joseph Camuccio if any endodontic issues arise to keep from damaging their dental health. For more questions on endodontics or different therapies for endodontic procedure, call Dr. Joseph Camuccio in Pompano Beach, FL at (954) 781-6170 or visit www.creativesmiles. Dr. Joseph Camuccio also proudly serves Pompano Beach, Coconut Beach, Lighthouse Point, Deerfield Beach, Boca Raton, Fort Lauderdale, and surrounding areas. This entry was posted in Endodontic Dentistry and tagged Dr. Joseph Camuccio, Endodontic Dentistry, Pompano Beach FL on March 21, 2014 by admin.